The LG G4 has recently released to a waiting market and is the newest flagship from the company. It has some extremely high-end specs, and sometimes it can be interesting to see how new handsets stand up against earlier devices. Today we’re concentrating on one particular aspect and showing an LG G4 vs LG G3 vs G2 vs Optimus G benchmark speed comparison. We’ll run through some of the key specs of these phones before we get to the benchmarking. The new LG G4 packs a Snapdragon 808 hexa-core processor (two cores at 1.82GHz and four at 1.44GHz), with Adreno 418 graphics, a 5.5-inch display with Quad HD resolution of 2560 x 1440, and 3GB of RAM. Last year’s LG G3 has a 2.5GHz Snapdragon 801 quad-core processor, Adreno 330 graphics, a 5.5-inch display with Quad HD resolution, and 3GB of RAM. The LG G2 released in 2013 and has a 2.26GHz Snapdragon 800 quad-core processor, Adreno 330 graphics, 5.2-inch display with Full HD resolution of 1920 x 1080, and 2GB of RAM. Finally the lesser LG Optimus G released back in 2012 and is powered by a 1.5GHz Snapdragon S4 Pro quad-core processor, Adreno 320 graphics, a 4.7-inch display with HD resolution of 1280 x 768, and 2GB of RAM. Obviously as these devices span a number of years the specs also vary by quite a bit. Therefore the results of a benchmark test could be intriguing. We’ll also point out that the LG G4 in this testing is running Android 5.1 Lollipop, the G3 is on Android 5.0, the G2 on Android 5.0.2, and the Optimus G is still on Android 4.1.2 Jelly Bean. If you scroll down this page you’ll come to a short YouTube video from Adrianisen showing a benchmark performance of these handsets. All four are shown lined up alongside each other and then the Geekbench 3 benchmark test is conducted on them. You’ll then see all of the scores displayed on the handsets. The LG G4 achieves a single-core score of 1112 and multi-core score of 3548. The LG G3 manages 963 and 2372 respectively, while the LG G2 attains scores of 922 and 2668. As you can see there’s not a notably big gap between the single-core results but with multi-core it’s a different story. The LG Optimus G takes quite a bit longer to run the test and finally achieves a single-core score of just 344 and multi-core score of 653. This is a hugely noticeable difference but perhaps we shouldn’t be too surprised with these scores considering the age of this phone. If you’ve enjoyed this testing you might also like to check out a previous test we shared showing bootup speeds of the LG G4 vs LG G3 vs LG G Flex 2. When you’ve watched the video below we’d like to hear from you. 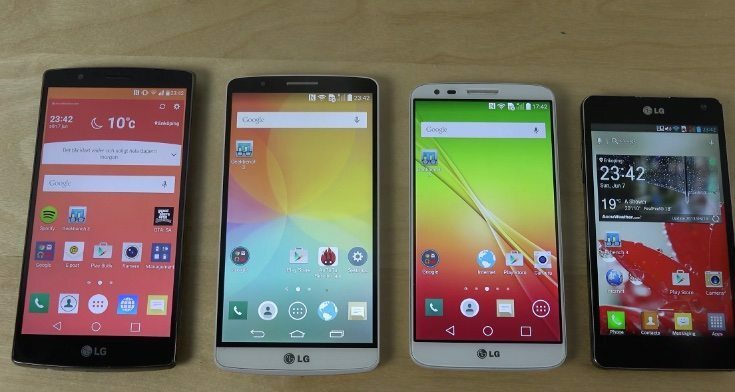 Does anything surprise you about the results of this benchmark comparison between the LG G4, LG G3, G2 and Optimus G?